What Makes Hennessey House so Special? Hennessey House is located in a residential district at the top of restaurant row in Historic Downtown Napa. Our guests can literally walk out the front door and enjoy fine dining at one of 30+ restaurants nearby. We are also just 1/3 mile from the Napa Wine Train Depot, and less than ¾ mile from the Oxbow Public Market, Uptown Theatre, and the Napa river promenade. There are 20+ wine tasting rooms in the Napa downtown area, as well as shops, art galleries, and a downtown artwalk. The Napa Valley vineyards are just minutes away by car. The Carneros Region, famous for its Chardonnay and Pinot Noir grapes, is to the south. The rest of the Napa Valley with many unique micro-climates, each favoring different qualities in grapes, stretches 20 miles to the north. In all there are over 400 wineries to choose from. Visit the THINGS TO DO page. 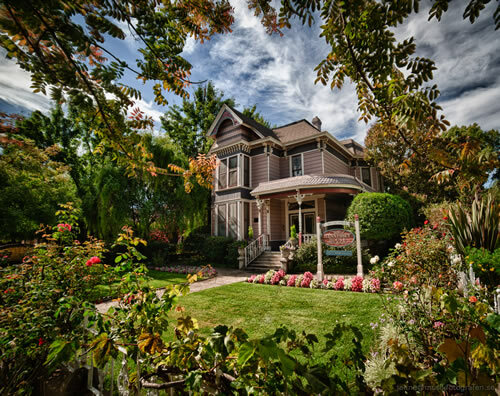 The Hennessey House Bed and Breakfast is on a beautiful ½ acre and includes lovely gardens, a relaxing patio, and off street parking for all guests. The ten guestrooms have private bathrooms and each guestroom is uniquely decorated.